This week I found some really beautifully thank you cards in my post pile – don’t get me wrong I love texts and direct messages, but there is something so touching about a hand written card, the intention of effort to hand write your thoughts and share them. One of my brides said ‘you were so much more than a florist to me’ and this has got me thinking about my role as part of a wedding overall. Planning a Wedding can be an emotional experience as a couple bring two families together. There becomes a union and sharing of values and ideas. On paper it works, but sometimes there are moments when the whole process can be a bit of a rollercoaster. If I were to offer any advice to a couple planning their wedding, one of the things would be you need to trust your chosen suppliers. A florist (like myself), is really unlikely to be in this line of work without genuinely caring about the whole picture of your day. I’m not sure about other florists (and there are many talented ones out there!) but I see my role in the party as bringing the ideas of a Bride and Groom together. My intention is to create something that has previously inside only their imagination. When you put it like this, it sounds like a big job? When I really think about it, an image or photo of something I make for each couple is likely to be on display someone’s mantelpiece for the rest of their lives – and of course witnessed by their closest relatives and friends in the flesh. This is quite a big deal? Not many people get to see a peek of THE Wedding Dress, know the colour scheme, find out about the sound track, and whether your Great Uncle Geoffrey gets a Buttonhole! 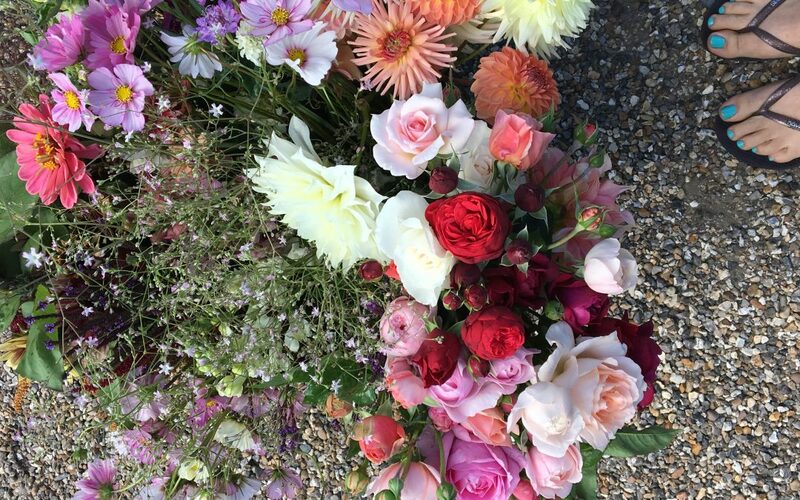 Working as a Wedding Florist is a total honour; it is high-pressured, emotional and wonderfully creative. We thrive on being trusted with such an important job, and finding the right one can be gold dust. Every time I deliver a Bridal Bouquet it is loved, I breathe the hugest sigh of relief (sometimes shed a tear!) and go home knowing I’ve got this until the next one. If you’d like to see my most up to date Wedding work; take a look at my Instagram grid, I’d love you to get in touch if you have any questions about Wedding Flowers.